It was disappointing as a finance specialization student to hear a teacher reciting finance books like a pro, and complaining afterwards that he wasn’t earning enough money. I realized he couldn’t teach me a thing about finances if he couldn’t deal with his own in a diligent manner. The article I had to read for the English class: Get a free ride from credit companies by Gregory Bresiger was more useful, and even though it wasn’t enough, it was a beginning. As I have been moulding my career, it has evolved up to self-employed, and I love this progress. However, in the equation between income and outcome, it is income that is not working because debt is not a major concern. 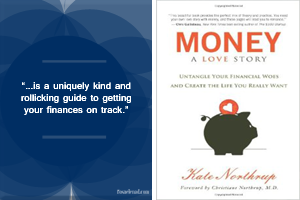 After reading MONEY, A LOVE STORY, there are a lot of ideas to digest and go deep in my understanding of money beyond the academic way. The first action is to take a quiz to know where you are right now about your relationship with money. I think the book works pretty well even from the title to heal finance issues. What does love have to do in the equation? Kate Northup explains it in the first chapter. Along the book, you’ll find exercises to work with all the ideas that the author writes about. Although, she mentions other authors that have helped her in her journey to financial freedom, and that I’ll be checking out as well.